Looking for an alternative activity for a day or evening out in Glasgow? 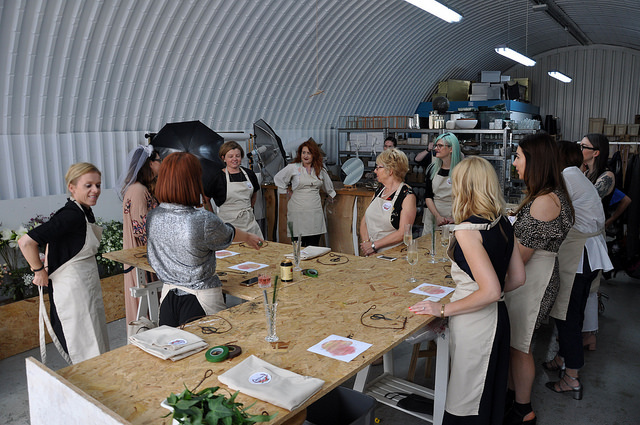 We can offer a range of classes and workshops as a private event for hen parties, stag parties, leaving do's, team building or just a good old get together with friends. As with everything we do this isn't a one size fits all, we'll work with you to plan the perfect event for you. 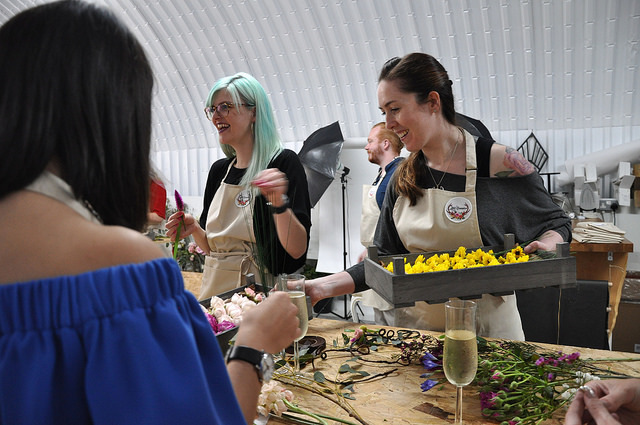 Be that flower crowns with fizz or buttonholes with beers get in touch with an idea, your desired date and the number of attendees and we can start putting together a plan. ‘My bridesmaids had kept me in the dark with all things related to me hen party reassuring me that it was ‘one less thing I had to worry about’ in the lead up to the wedding so you can imagine my confusion and mild panic when a taxi dropped us off outside a load of industrial units in Tradeston for our activity! We were buzzed in through a private gate and what awaited us around the corner could not have been any more perfect. Hayley from Little Botanica, who I know having met her to discuss our wedding flowers (which LB are doing) and from nipping along to any pop up shops they have, was waiting to greet me with a massive smile beside a beautiful antique trolley with pre filled prosecco glasses and hunky bar man. His sole job that day was to keep our glasses full for the duration and what a wonderful job he did! 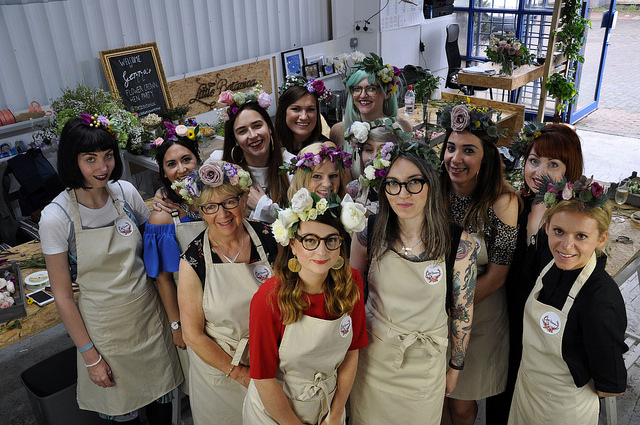 After getting over the initial excitement of seeing all of my hens, having a glass of prosecco, taking pictures of the beautiful personalised hand painted board and munching the nibbles LB had kindly put out it was time to get on with the task at hand, FLOWER CROWNS! LB had set each of us 15 over excited hens a station equipped with Little Botanica apron, scissors, flower tape and wire. 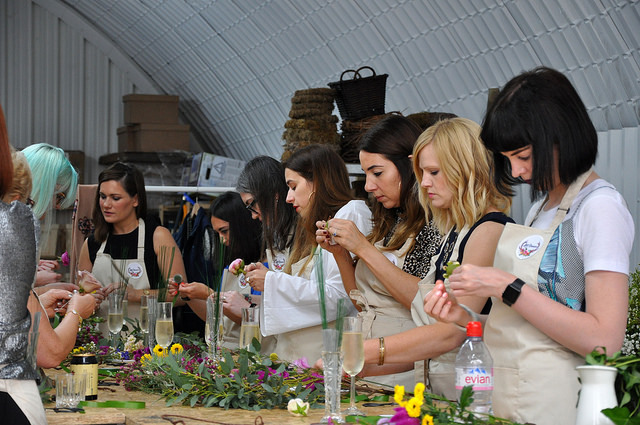 We were given a demonstration on how best to prepare the flowers (which looks much easier than it actually is and involves wiring, taping and cutting each individual flower before attaching then to your crown!) by the LB ladies and then left to choose whatever flowers we wanted from their vast and interesting collection. 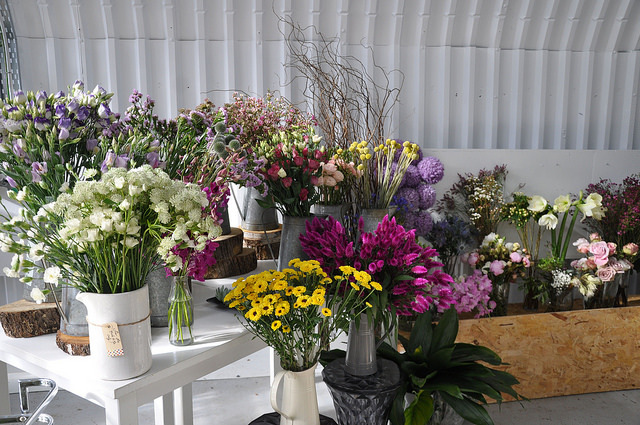 Peonies, Alium, sweet peas, thistles, all colours of roses, gypsophila and eucalyptus to name a few. There was also a whole jug of white flowers especially set aside especially for me! After some 10 minutes of us preparing our own flowers the LB ladies brought out lots of trays of pre prepared flowers for us to use, cue much cheering. They make it look so easy! They were also on hand to help us attach our flowers to the crown as and when we needed, which was a lot. What we ended up with were 15 very unique and each equally beautiful flower crowns that not only looked so pretty it was also something we could wear all together as a group. LB had set up a little photo booth space with the perfect lighting for selfies! Who needs snap chat filters! The LB staff could not have done any more and I would like to take the opportunity say thank you to my bridesmaids Hannah, Gillian, Suzanne and Susan for organising the perfect activity. After leaving LB we walked down to the Laurieston to carry on our day, you can imagine the expressions on the wee mens faces when 15 hens with flower crowns on walked in!